At Quadractics we are passionate about making Business Intelligence easy. We have built a successful BI Practice by helping our clients align key performance indicators (KPIs) with their strategic goals and objectives. Our practice include strategic planning, analysis, design, development, implementation, support and training for any BI/DW implementation. We have some of the best experts in the industry who come with an impressive blend of business and technical knowledge. Whether you require new development, enhancements or support, we simply become your extended team and deliver a turnkey BI solution. In addition, our experts can help assess and analyze organization’s BI needs and recommend an appropriate solution that makes the most business sense, still balancing cost and delivering ROI for your BI investment. Quadractics Business intelligence capabilities are classified in two major areas as shown below. Build a comprehensive project plan for a successful BI deployment..
Identify final one or two vendors and engage them for a POC focusing on key areas of concern and evaluate key factors such as Scalable, handle large amounts of data, no of users, -Proactive Delivery & Alerting mechanism, Web delivery, Security, Mobile capabilities and more. After deploying a BI Project, many organizations realize that their business intelligence strategy is not working and undergo several challenges. Many questions arise such as multiple technologies being utilized, inconsistent data, access to data, multiple instances of the same data, ownership, governance, security, performance and so on. Quadratics has a proven methodology that can answer all the above mentioned factors and improve your BI investment by using our maturity assessment. Our framework has gone through several evolutions based on relevant experiences, and we believe that decomposing the overall assessment strategy is the right approach for optimal results. The below figure illustrates Quadratics’s innovative framework to conduct a BI Maturity Assessment. The above framework provides a complete landscape for the assessment strategy and will address several critical areas during the entire life cycle of the assessment. Quadratics’s BI development capabilities covers the complete spectrum which includes data integration, analysis, reporting and analytical applications. We have a depth of knowledge and experience to design, develop, and implement BI project right from gathering requirements for the current or future business objectives. Some of the key services offered include: BI Architecture Design & Development, Dimensional Data Modeling, ETL Development & Reporting. The Business Intelligence market is overwhelmed with several vendors who offer attractive features, visualizations, cloud versions, etc. This is posing challenges for organizations to choose the right technology that suits their business needs. 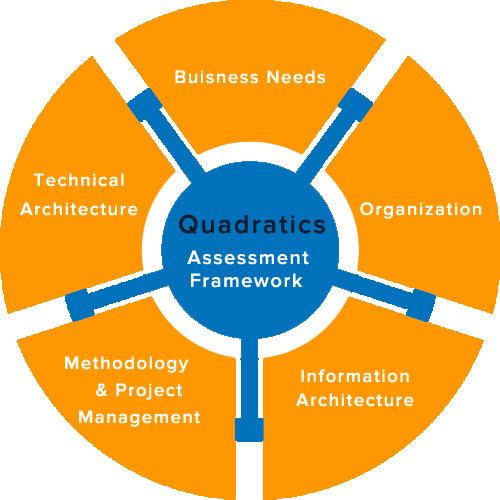 Quadratics has in-depth experience in assisting its clients to define, prioritize BI requirements and evaluates BI tool vendor landscape. During this phase Quadratics will narrow down the available services that are right for a specific organization and select the appropriate BI tool set that best fits the business objectives.